This egg shaped art glass award is a unique yet beautiful and artistic spin on a traditional and typical award. Each glass award is individually blown making each one different from the next and one of a kind. 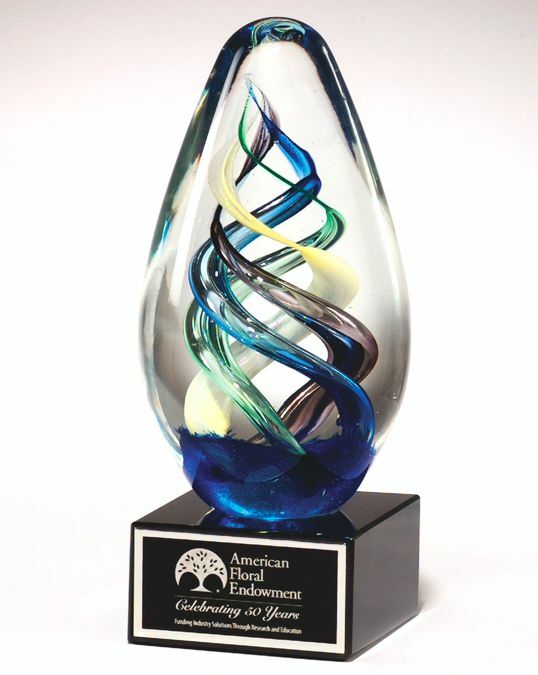 The 7.125 inch tall by 2.75 inch wide clear egg-shaped award will liven up any space, as well as the face of the recipient, as it comes to life with its intertwining vibrant multicolored swirled center. Hit Trophy’s design team will personalize the black marble base of this award for free with any message and/or logo that you provide. This 1610 glass egg comes in a deluxe presentation gift box.